And don’t forget that as a Gold rewards member, you get free refills on brewed coffee and tea drinks. Yes, tea too gets free refills. The rest of the options are bad news. What used to be free extras and sub, starting April 16, they will cost 25 Stars each. The any handcrafted drink of your choice goes up from 125 to 150 stars. And the any sandwich or salad, which used to be 125 stars as well, it will now jump to 200 stars. 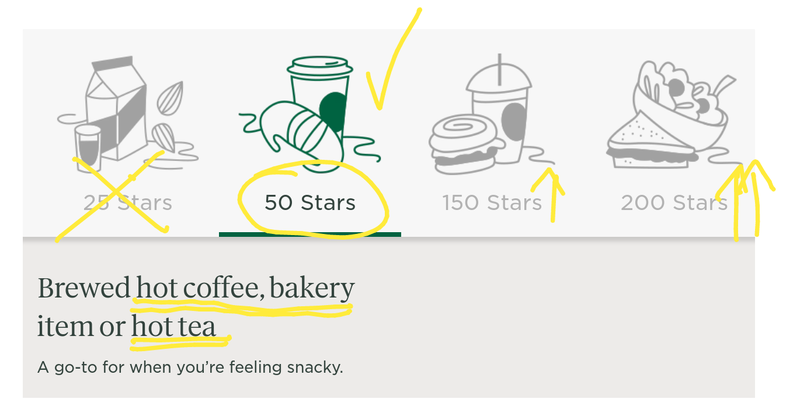 Part of the reason for this (I’m guessing) is that Starbucks has been offering more expensive food items in their menu, and one could have gotten an $8-$9 food item for 125 stars. Given that you earn 2 stars per dollar, with the soon-expiring program, free item was earned at 125 stars. In other words, for every $62.50 spend, you got a free item of your choice. Depending on how you historically redeem your rewards, you can place a value on the free item. For example, if you get a $6 sandwich most of the time, 125 stars were worth $6 to you with the old program. A new intriguing option (I ran out of space in the screenshot above) is at 400 stars. You can get your choice of a bag of coffee (that’s one pound of coffee), Starbucks-branded hot and cold cups (not the $2 plastic-y one, the “real” ones), or other coffee accessories. So, doing the math above, and with the new programme in mind, you can figure out whether it’s preferable to save your points for 400 redemptions or purchase coffee with your own money and redeem your points for drinks and food. On the plus side, there are increasing options to earn more stars, including double stars, more double days, app bonuses, special games, VISA Checkout and Chase reload offers, co-branded Starbucks VISA credit and prepaid cards, and more.